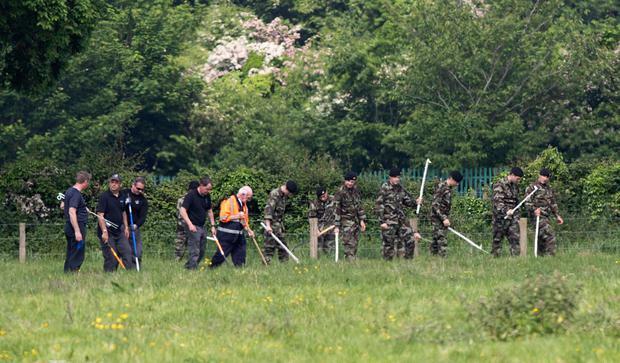 Army units and Coast Guard personnel were drafted in yesterday to help in the search for evidence as gardai in Louth continue to piece together the events that led to the brutal murder of 18-year-old Cameron Reilly. Two sites near the teenager's home in Dunleer were sealed off as part of a large-scale operation. Gardai hope their efforts will recover the teenager's mobile phone which may hold the key to his last hours. They believe this key piece of evidence will help direct them towards the teenager's killer. Machinery was being used at a field behind an industrial estate close to where his body was found last weekend. This site has been the focus of significant Garda activity towards the end of last week. Cameron's body was discovered last Saturday and a post-mortem examination disclosed catastrophic neck injuries. Five army units were cutting grass and some overgrown woodland as they helped with the search. They were joined by the Garda Water Unit who were conducting a simultaneous operation in a reservoir in the field where they believe his phone may have been cast away as part of an attempt to conceal evidence. This reservoir had been drained earlier last week to facilitate the Garda search efforts. A short distance away, in a field behind the local primary school, Army and Coast Guard personnel were joined by members of the Civil Defence as they combed the ground with slash hooks and strimmers as part of a significant operation. They spent the day in close formation carrying out a grid search in a painstaking operation which also involved machinery. The search continued as the teenager lay in repose in a funeral home in the village. Locals began paying their respects shortly after lunch yesterday and Cameron's remains will be in repose throughout today before his removal to the nearby St Brigid's Church tomorrow morning for his funeral Mass after it is celebrated at 11am. Since the murder investigation commenced last week gardai have believed the answer to who was involved in Mr Reilly's death lies close to the town of Dunleer. Gardai have already drawn up a list of people they want to question and it is hoped discovering the teenager's missing mobile phone will help to refine their inquiries. However, progress has been slow, with gardai last night saying their appeal for information remains in force and some of those young people who could help the investigation have still not come forward. Inspector John O'Flaherty has requested that home and business owners in Dunleer check their gardens and surrounding areas for the missing phone. He said wheelie bins and waste skips could also have been used to dispose of the mobile telephone after the murder.